Another act is coming to Manila this December 2014, the hit broadway musical CHICAGO. 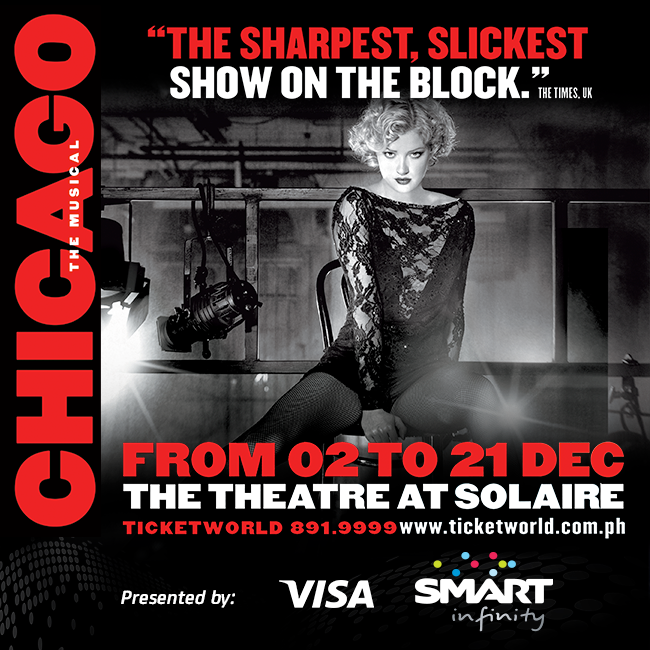 Considered as the longest-running musical revival and the longest-running American musical in Broadway history, Chicago will excite Philippine Audience as they will bring here this award winning musical from December 2 to 21 at the Theater of Solaire Resort and Casino. As a special treat, Smart Communications is offering a 10% discount to its Smart Infinity Subscribers when they purchase tickets for the Broadway Musical CHICAGO from August 4 until September 8 before it will be opened to the general public on September 9, 2014. New Smart Infinity plan subscribers will also receive for free VIP Tickets to this once in a lifetime event other than gadgets and premium service they'll get. To complete the ‘Chicago’ experience, a suite of special-edition ‘Infinity Music Plans’ will be offered by Smart Infinity. The Infinity Music Plan 3500 comes with two complimentary orchestra VIP tickets to ‘Chicago,’ along with two Misfit Shine fitness tracking gadgets, one ‘Chicago’ album and 30 songs monthly to go with the call,text and data subscription already bundled with the plan. Also, Plan 5000 comes with either a Samsung S5 or iPhone 5s, two orchestra VIP tickets, a ‘Chicago’ album, and 30 songs monthly along with call, text and data. Finally, Plan 8000 provides a free Macbook Air, two orchestra VIP tickets, a ‘Chicago’ album, and 30 songs. Smart Infinity does not only provide premium mobile service but also delightful experiences to its subscribers like the world class musical they already brought in, from Cats to Mamma Mia, to The Phantom of the Opera and the most recent Wicked. JM De Guzman is back!